A budding criminal mastermind was quickly apprehended by police after posting pictures of himself, mid-burglary, on his victim's Facebook page. Most run-of-the-mill B&E guys aren't the brightest bulbs on the tree to begin with, but Rodney Knight of Washington D.C. really takes the cake. Back in December he broke into the home of Washington Post journalist Marc Fisher and stole items including two laptop computers and a new winter coat, along with about $400 in cash. 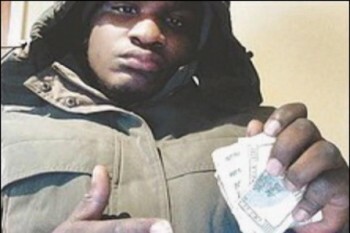 Nothing too unusual about that, but before he fled the scene he took a photo of himself wearing the coat and holding the cash while flashing a thumbs-up to the camera. And then for some reason he posted that picture on Fisher's son's Facebook page. That's right. He took a picture of himself committing a felony and then gave it to his victim. Needless to say, police were able to make an arrest fairly quickly and last week Knight pleaded guilty to second-degree burglary as well as carrying a gun without a license. What possessed him to post the picture on Facebook remains a mystery, although legal experts suspect that being a complete idiot was likely a contributing factor.